Sayfullo Habibullaevic Saipov, an Uzbek national who immigrated to the United States in 2010, drove a truck for roughly a mile down a bike path in New York City on October 31, 2017, in a vehicular attack that killed eight people and injured at least 12 others.Benjamin Mueller et. al, “Terror Attack Kills 8 and Injures 11 in Manhattan,” New York Times, October 31, 2017, https://www.nytimes.com/2017/10/31/nyregion/police-shooting-lower-manhattan.html; Corey Kilgannon and Joseph Goldstein, “Sayfullo Saipov, the Suspect in the New York Terror Attack, and His Past,” New York Times, October 31, 2017, https://www.nytimes.com/2017/10/31/nyregion/sayfullo-saipov-manhattan-truck-attack.html; “Complaint Against Suspect in Manhattan Terror Attack,” New York Times, November 1, 2017, https://www.nytimes.com/interactive/2017/11/01/us/document-U-S-v-Sayfullo-Saipov-Complaint.html. He was ultimately taken into custody after being shot by a police officer.Mahita Gajanan and Alana Abramsom, “What to Know About New York City Terror Attack Suspect Sayfullo Saipov,” Time, November 1, 2017, http://time.com/5004635/new-york-city-attack-suspect-sayfullo-saipov-lower-manhattan/; Benjamin Mueller et. al, “Terror Attack Kills 8 and Injures 11 in Manhattan,” New York Times, October 31, 2017, https://www.nytimes.com/2017/10/31/nyregion/police-shooting-lower-manhattan.html. Saipov has been charged with multiple counts of murder, attempted murder, providing material support to ISIS, and one count of violence and destruction of a motor vehicle causing death.“Prosecutors Describe Driver’s Plan to Kill in Manhattan Terror Attack,” New York Times, November 1, 2017, https://www.nytimes.com/2017/11/01/nyregion/driver-had-been-planning-attack-in-manhattan-for-weeks-police-say.html. In an interview with authorities, Saipov stated that he had been inspired to carry out the attack by ISIS propaganda videos.“Complaint Against Suspect in Manhattan Terror Attack,” New York Times, November 1, 2017, https://www.nytimes.com/interactive/2017/11/01/us/document-U-S-v-Sayfullo-Saipov-Complaint.html. Saipov has pled not guilty. Prosecutors are seeking the death penalty.Tom Hays, “Prosecutors want death penalty for bike path attacker,” Associated Press, September 28, 2018, https://www.apnews.com/39ff0a548ee94272a6276d0d879fa7d1; Larry Neumeister, “Lawyers fight to ban death penalty from truck attack trial,” Associated Press, October 9, 2018, https://www.apnews.com/a3389cba14394ae9aa6a2ee04a1a587a. Saipov immigrated to the United States from Tashkent, Uzbekistan, in March 2010, through the State Department’s Diversity Visa Program––a lottery program for countries with low rates of immigration to the United States.Corey Kilgannon and Joseph Goldstein, “Sayfullo Saipov, the Suspect in the New York Terror Attack, and His Past,” New York Times, October 31, 2017, https://www.nytimes.com/2017/10/31/nyregion/sayfullo-saipov-manhattan-truck-attack.html; Travis Fedschun, “NYC terror attack suspect, Sayfullo Saipov, entered US through Diversity Visa Program,” Fox News, November 1, 2017, http://www.foxnews.com/us/2017/11/01/nyc-terror-attack-suspect-sayfullo-saipov-entered-us-through-diversity-visa-program.html. Through the program, Saipov became a U.S. legal permanent resident.Holly Yan and James Griffiths, “Who is New York terror suspect Sayfullo Saipov?” CNN, November 1, 2017, http://www.cnn.com/2017/11/01/us/sayfullo-saipov-new-york-attack/index.html; Kurtis Lee, “Here’s the visa program New York terrorism suspect Sayfullo Saipov used to get into the country,” Los Angeles Times, November 1, 2017, http://www.latimes.com/nation/la-na-diversity-visa-20171101-htmlstory.html. Upon arriving in the United States, Saipov first settled in Ohio. He worked as a truck driver and eventually came to own two trucking companies.Benjamin Mueller et al., “Prosecutors Describe Driver’s Plan to Kill in Manhattan Terror Attack,” New York Times, November 1, 2017, https://www.nytimes.com/2017/11/01/nyregion/driver-had-been-planning-attack-in-manhattan-for-weeks-police-say.html; Holly Yan and James Griffiths, “Who is New York terror suspect Sayfullo Saipov?” CNN, November 1, 2017, http://www.cnn.com/2017/11/01/us/sayfullo-saipov-new-york-attack/index.html. Saipov married an Uzbek woman, Nozima Odilova, in 2013, and in the summer of 2015, the couple moved to Tampa, Florida.Holly Yan and James Griffiths, “Who is New York terror suspect Sayfullo Saipov?” CNN, November 1, 2017, http://www.cnn.com/2017/11/01/us/sayfullo-saipov-new-york-attack/index.html; Benjamin Mueller et al., “Prosecutors Describe Driver’s Plan to Kill in Manhattan Terror Attack,” New York Times, November 1, 2017, https://www.nytimes.com/2017/11/01/nyregion/driver-had-been-planning-attack-in-manhattan-for-weeks-police-say.html. In Florida, Saipov reportedly had difficulty finding work and struggled with his finances. He attended a mosque in Tampa, where he reportedly attracted some concern due to his extremist beliefs. Other acquaintances reported that Saipov had espoused extremist beliefs ever since his arrival in the United States in 2010.Benjamin Mueller et al., “Prosecutors Describe Driver’s Plan to Kill in Manhattan Terror Attack,” New York Times, November 1, 2017, https://www.nytimes.com/2017/11/01/nyregion/driver-had-been-planning-attack-in-manhattan-for-weeks-police-say.html. Saipov was ticketed in Missouri in December 2015 for an equipment violation as a truck driver. He was briefly taken into custody in 2016 because he failed to pay the requisite fine, but was released after posting a bond. In March 2017, Saipov, his wife, and three children moved to Paterson, New Jersey.Benjamin Mueller et al., “Prosecutors Describe Driver’s Plan to Kill in Manhattan Terror Attack,” New York Times, November 1, 2017, https://www.nytimes.com/2017/11/01/nyregion/driver-had-been-planning-attack-in-manhattan-for-weeks-police-say.html. There, Saipov worked as an Uber driver.Holly Yan and James Griffiths, “Who is New York terror suspect Sayfullo Saipov?” CNN, November 1, 2017, http://www.cnn.com/2017/11/01/us/sayfullo-saipov-new-york-attack/index.html. According to the criminal complaint filed against him, Saipov stated that he began planning the attack about a year in advance, and made the decision to use a truck about two months prior “in order to inflict maximum damage against civilians.“Complaint Against Suspect in Manhattan Terror Attack,” New York Times, November 1, 2017, https://www.nytimes.com/interactive/2017/11/01/us/document-U-S-v-Sayfullo-Saipov-Complaint.html.” In the weeks preceding the attack, Saipov reportedly drove multiple times to the area of the attack and, on October 22, he rented a truck from Home Depot to take a test drive.Jonathan Dienst et al, “Sayfullo Saipov’s Path from Immigrant Trucker to Accused Terrorist,” NBC News, November 1, 2017, https://www.nbcnews.com/storyline/nyc-terrorist-attack/sayfullo-saipov-s-path-immigrant-trucker-accused-terrorist-n816331; Benjamin Mueller et al., “Prosecutors Describe Driver’s Plan to Kill in Manhattan Terror Attack,” New York Times, November 1, 2017, https://www.nytimes.com/2017/11/01/nyregion/driver-had-been-planning-attack-in-manhattan-for-weeks-police-say.html; “Complaint Against Suspect in Manhattan Terror Attack,” New York Times, November 1, 2017, https://www.nytimes.com/interactive/2017/11/01/us/document-U-S-v-Sayfullo-Saipov-Complaint.html. Saipov also stated that he considered putting ISIS flags on the outside of his truck, but ultimately decided not to because he did not want to attract attention. He stated that he decided to carry out the attack on Halloween because he thought there would be more people on the streets and wanted to “kill as many people as he could.”“Complaint Against Suspect in Manhattan Terror Attack,” New York Times, November 1, 2017, https://www.nytimes.com/interactive/2017/11/01/us/document-U-S-v-Sayfullo-Saipov-Complaint.html. On October 31, 2017, Saipov rented a pickup truck from a Home Depot in Paissac, New Jersey, at about 2:06 p.m., then drove into Manhattan. At 3:04 p.m., he drove the truck southbound onto a crowded bike path for about a mile alongside the West Side Highway near Houston Street in Lower Manhattan, killing eight people and injuring at least 12 others. After crashing into a school bus, he jumped out of the truck holding a pellet and paintball gun and began shouting, “Allahu akbar.”Benjamin Mueller et al., “Prosecutors Describe Driver’s Plan to Kill in Manhattan Terror Attack,” New York Times, November 1, 2017, https://www.nytimes.com/2017/11/01/nyregion/driver-had-been-planning-attack-in-manhattan-for-weeks-police-say.html; Benjamin Mueller et. al, “Terror Attack Kills 8 and Injures 11 in Manhattan,” New York Times, October 31, 2017, https://www.nytimes.com/2017/10/31/nyregion/police-shooting-lower-manhattan.html; “Complaint Against Suspect in Manhattan Terror Attack,” New York Times, November 1, 2017, https://www.nytimes.com/interactive/2017/11/01/us/document-U-S-v-Sayfullo-Saipov-Complaint.html. A police officer shot Saipov in the abdomen, and he was taken into the hospital in critical condition to undergo surgery.Mahita Gajanan and Alana Abramsom, “What to Know About New York City Terror Attack Suspect Sayfullo Saipov,” Time, November 1, 2017, http://time.com/5004635/new-york-city-attack-suspect-sayfullo-saipov-lower-manhattan/; Benjamin Mueller et. al, “Terror Attack Kills 8 and Injures 11 in Manhattan,” New York Times, October 31, 2017, https://www.nytimes.com/2017/10/31/nyregion/police-shooting-lower-manhattan.html; Holly Yan and James Griffiths, “Who is New York terror suspect Sayfullo Saipov?” CNN, November 1, 2017, http://www.cnn.com/2017/11/01/us/sayfullo-saipov-new-york-attack/index.html. In the truck, authorities found a stun gun and a bag containing three knives.“Complaint Against Suspect in Manhattan Terror Attack,” New York Times, November 1, 2017, https://www.nytimes.com/interactive/2017/11/01/us/document-U-S-v-Sayfullo-Saipov-Complaint.html. Authorities also found a document indicating his allegiance to ISIS at the scene of the attack.Benjamin Mueller et. al, “Terror Attack Kills 8 and Injures 11 in Manhattan,” New York Times, October 31, 2017, https://www.nytimes.com/2017/10/31/nyregion/police-shooting-lower-manhattan.html; “Complaint Against Suspect in Manhattan Terror Attack,” New York Times, November 1, 2017, https://www.nytimes.com/interactive/2017/11/01/us/document-U-S-v-Sayfullo-Saipov-Complaint.html. Authorities determined that Saipov had been inspired by ISIS propaganda. John Miller, New York Police Department deputy commissioner for intelligence and counterterrorism, stated that Saipov appeared to have followed instructions “almost to a T,” which ISIS published in its November 2016 issue of its English-language propaganda magazine, Rumiyah, on how to carry out a truck attack.Benjamin Mueller et al., “Prosecutors Describe Driver’s Plan to Kill in Manhattan Terror Attack,” New York Times, November 1, 2017, https://www.nytimes.com/2017/11/01/nyregion/driver-had-been-planning-attack-in-manhattan-for-weeks-police-say.html. Saipov was questioned by authorities while in custody. During the interview, Saipov told authorities that he had been inspired to carry out the attack by ISIS videos––particularly one in which ISIS emir Abu Bakr al-Baghdadi asked what Muslims in the West were doing in response to the killing of Muslims in Iraq. Authorities found 90 ISIS propaganda videos on his cell phone, including a bomb-making instruction video, a beheading video, a video in which a prisoner is shot, and a video in which a prisoner is run over by a vehicle. Authorities also reported that out of 3,800 images on the phone, there were “many” that appeared to be ISIS-related, including images of Baghdadi. Furthermore, during his interview with authorities, Saipov stated that he “felt good about what he had done” and asked to display ISIS’s flag in his hospital room.“Complaint Against Suspect in Manhattan Terror Attack,” New York Times, November 1, 2017, https://www.nytimes.com/interactive/2017/11/01/us/document-U-S-v-Sayfullo-Saipov-Complaint.html. On November 1, federal prosecutors filed charges against Saipov in civilian court, which included one count of providing material support to terrorists and one count of violence and destruction of a motor vehicle causing death. The latter charge carries the possibility of the death penalty.Prosecutors Describe Driver’s Plan to Kill in Manhattan Terror Attack,” New York Times, November 1, 2017, https://www.nytimes.com/2017/11/01/nyregion/driver-had-been-planning-attack-in-manhattan-for-weeks-police-say.html. On November 22, he was indicted in federal court on 22 charges, including multiple counts of murder and attempted murder in aid of racketeering, providing and attempting to provide material aid to ISIS, and one count of violence and destruction of a motor vehicle resulting in death.“Sayfullo Saipov Charged With Terrorism and Murder in Aid of Racketeering in Connection With Lower Manhattan Truck Attack,” U.S. Department of Justice, November 21, 2017, https://www.justice.gov/opa/pr/sayfullo-saipov-charged-terrorism-and-murder-aid-racketeering-connection-lower-manhattan. In June 2018, he was charged with an additional six counts of attempted murder.Kaja Whitehouse, “Alleged bike-path terrorist faces additional murder charges,” New York Post, June 20, 2018, https://nypost.com/2018/06/20/alleged-bike-path-terrorist-faces-additional-murder-charges/. Saipov has pled not guilty but his lawyers have said he is willing to plead guilty if he is spared the death penalty.Larry Neumeister, “Lawyers: Bike path attack defendant willing to plead guilty,” Associated Press, January 17, 2018, https://www.apnews.com/1cfc28fcb9c546858beb8b4f8c63f8a9. Saipov himself had never been the subject of a prior FBI investigation, but he previously attended a wedding in Florida of an Uzbek national who was under investigation by the FBI. An FBI investigation is reportedly looking into whether Saipov had any meaningful links to known or suspected terrorists.Holly Yan and James Griffiths, “Who is New York terror suspect Sayfullo Saipov?” CNN, November 1, 2017, http://www.cnn.com/2017/11/01/us/sayfullo-saipov-new-york-attack/index.html; Benjamin Mueller et al., “Prosecutors Describe Driver’s Plan to Kill in Manhattan Terror Attack,” New York Times, November 1, 2017, https://www.nytimes.com/2017/11/01/nyregion/driver-had-been-planning-attack-in-manhattan-for-weeks-police-say.html; Corey Kilgannon and Joseph Goldstein, “Sayfullo Saipov, the Suspect in the New York Terror Attack, and His Past,” New York Times, October 31, 2017, https://www.nytimes.com/2017/10/31/nyregion/sayfullo-saipov-manhattan-truck-attack.html. On November 2, 2017, ISIS claimed responsibility for the attack, calling Saipov “one of the caliphate soldiers.“ISIS claims responsibility for New York truck attack, report says,” Fox News, November 2, 2017, http://www.foxnews.com/world/2017/11/02/isis-claims-responsibility-for-new-york-truck-attack-report-says.html. During a June 22, 2018, court appearance, Saipov praised ISIS for spreading sharia (Islamic law) and rejected the court’s authority.Larry Neumeister, “Man charged in bike path killings speaks in court of ‘Allah,’” Associated Press, June 22, 2018, https://www.apnews.com/8001394ef2824dfaa99780a84ec42e12. Federal prosecutors announced in September 2018 that they would seek the death penalty against Saipov. His trial is scheduled for October 2019.Tom Hays, “Prosecutors want death penalty for bike path attacker,” Associated Press, September 28, 2018, https://www.apnews.com/39ff0a548ee94272a6276d0d879fa7d1; Larry Neumeister, “Lawyers fight to ban death penalty from truck attack trial,” Associated Press, October 9, 2018, https://www.apnews.com/a3389cba14394ae9aa6a2ee04a1a587a. Fayfullo FaipovMahita Gajanan and Alana Abramsom, “What to Know About New York City Terror Attack Suspect Sayfullo Saipov,” Time, November 1, 2017, http://time.com/5004635/new-york-city-attack-suspect-sayfullo-saipov-lower-manhattan/. Sayfullo SaipovMahita Gajanan and Alana Abramsom, “What to Know About New York City Terror Attack Suspect Sayfullo Saipov,” Time, November 1, 2017, http://time.com/5004635/new-york-city-attack-suspect-sayfullo-saipov-lower-manhattan/. 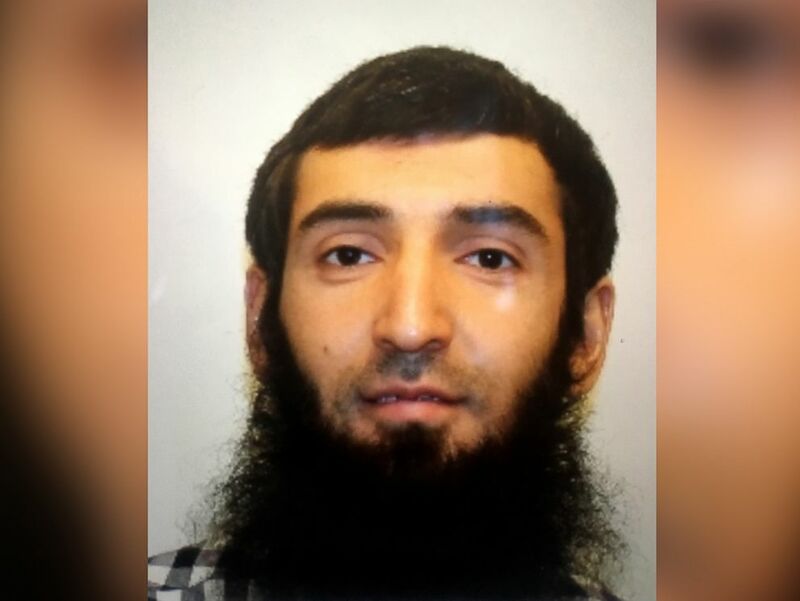 Sayfullo Habibullaevic Saipov, an Uzbek national who immigrated to the United States in 2010, drove a truck for roughly a mile down a bike path in New York City on October 31, 2017, in a vehicular attack that killed eight people and injured at least 12 others.